About half of Americans (46%) say they plan to watch as Donald Trump takes the presidential oath of office on Friday, while 51% say they do not intend to watch the inauguration. There is a wide partisan gap over plans to watch the inauguration, according to a new Pew Research Center survey, conducted Jan. 4-9 among 1,502 adults. About seven-in-ten Republicans and Republican-leaning independents (69%) say they will watch the event, compared with just 30% of Democrats and Democratic leaners. 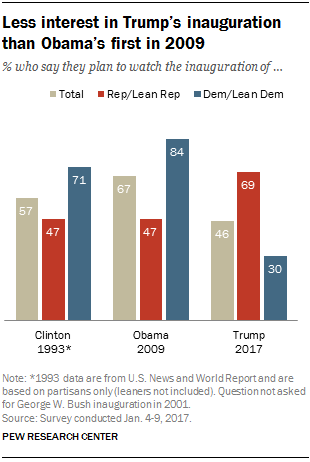 Despite their overall support for the president-elect and his plans, Republicans are less enthusiastic about watching Trump’s inauguration than Democrats were about watching Obama’s eight years ago (69% of Republicans today, compared with 84% of Democrats in 2009). Republicans also were more interested in watching Obama’s inaugural in 2009 than Democrats are in watching Trump’s this week. In 2009, nearly half of Republicans and Republican leaners (47%) planned to watch Obama take the oath of office. Even if they were offered a ticket to the inauguration, many Americans say they would not attend it, as was the case for Obama’s inaugural in 2009. Just 39% of Americans say they would attend this year’s inauguration if offered a ticket; 43% said they would in 2009. Perhaps not surprisingly, Americans’ interest in attending the inauguration this week falls along party lines: While 65% of Republicans and Republican leaners say they would attend if offered a ticket, only 16% of Democrats and Democratic leaners say they would.